Krafting Kreations: It's Triple Time! We’re having fun with the Triple Time Stamping technique over at the Friday Mashup today! Click HERE to see the tutorial that I posted yesterday on this technique. So here is what I made for this fun challenge! Create a project using 3 of the following colors "Crumb Cake, Summer Starfruit, Pacific Point or Daffodil Delight". Create a project with the "Triple Time Stamping Technique". I started off by cutting a piece of Crumb Cake card stock 5-1/2” x 8-1/2” and scored it at 4-1/4”. Next I used the second from smallest Labels framelit and the third from smallest Ovals framelit and ran both through the Big Shot with a scrap of Whisper White card stock. I applied 2-Way Glue Pen onto the back of the die cut shapes, allowed the glue to dry until it was clear, then adhered them on the card front. I stamped the swirls from Everything Eleanor all over the card front in Crumb Cake ink. I peeled back up the Whisper White pieces. I cut a piece of Daffodil Delight card stock 1/2” x 5-1/2” and adhered it onto the bottom of the card front. I cut a piece of Silver Glimmer Paper (because it’s gotta be sparkly!) 1/4” x 5-1/2” and adhered it on top of the Daffodil Delight strip. For the oval mat I used the fourth from smallest oval framelit and ran it through the Big Shot with a scrap of Summer Starfruit card stock. I adhered the stamped oval onto the Summer Starfruit oval. I adhered the oval onto the left side of the card front with Stampin’ Dimensionals. Make sure to line up your stamped images! For the label mat I used the third from smallest Labels framelit and ran it through my trusty Big Shot with a scrap of Pacific Point card stock. I adhered the stamped label onto the Pacific Point label. Then I used my Paper-Piercing Tool, Stampin’ Pierce Mat, and Festive Paper-Piercing Pack to pierce holes around both label shapes. I adhered the label onto the card front with Stampin’ Dimensionals, making sure that the right side of the label overlapped the oval. Make sure to line up your stamped images! Finally I cut a small piece of Early Espresso baker’s twine and treaded it through the holes of a Daffodil Delight Brights button (one of the old ones) and tied it into a bow. I adhered the button onto the bottom of the oval with a Glue Dot. That’s it! 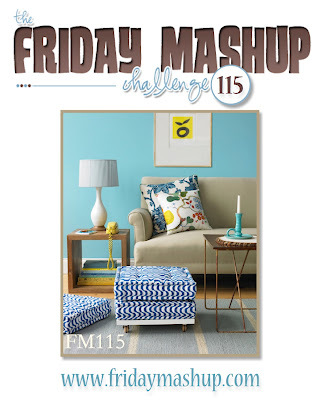 If you have a chance head on over to the Friday Mashup to see the wonderful creations that the rest of the design team came up with and to add your project!